The Low Down: Zara has escaped and is on the run. The Croak newspaper, The Obituary, is full of stories where Zara has been gallivanting around and damning bad guys. The Senior Grims in Croak trust Lex even less now that they know Lex accidentally “shared” her ability to damn souls with Zara. Norwood and Heloise are in peak form, calling secret meetings, twisting the truth, and bad-mouthing the Juniors and Uncle Mort. They will stop at nothing to oust Mort from his position as mayor, which is exactly what ends up happening. Using the climate of fear as a weapon, they put the blame for all of Croak’s recent misfortunes squarely in the laps of Lex and Mort. But Lex has problems of her own. Her beloved sister is dead; she has to constantly release her powers so she doesn’t damn anyone accidentally; all the Seniors hate and mistrust her; Zara has started killing innocents; the place that used to feel like home now feels like a prison; and there is the mystery to solve of a previous Grim who went rogue. If that riddle is answered, can Zara be stopped? Best Thang ‘Bout It: While there are definitely some boo-hoo moments, action and romance, humor rules in this story. It makes sense; if your job is dark, you need to lighten things up, right? My favorite has to be Cordy and (King) Tut. Remember, he was the Boy King and died when he was about 18…so, totally possible. And he has a camel. And great abs. There are a couple of new Juniors that add just the right amount of freshness to the story and Norwood/Heloise are still horrible, mean and power hungry. The Juniors’ get to take a trip to DeMyse, so we see another Grim city. There are a couple of HUGE twists and, I swear, I didn’t see one of them coming. I figured that REMOVED FOR YOUR DISCOVERY would happen at some time, but never REDACTED FOR YOUR SAFETY. Oh my. I’m Cranky Because: Oh I so can’t tell you! Suffice it to say that you will know ‘em when you see ‘em. Tweet me (@InkandPage) when you know what I am talking about, ‘K? Should You? : Once upon a time, there was a little girl. Soon this girl learned to read (a prodigy, probably, but never tested). She read before bed, she read in the car, she read at the table, she read in class, she read walking, at red lights, on a plane, on a train, and she says WITHOUT A DOUBT, BUT READ ‘CROAK’ FIRST. Then she returned to reading. 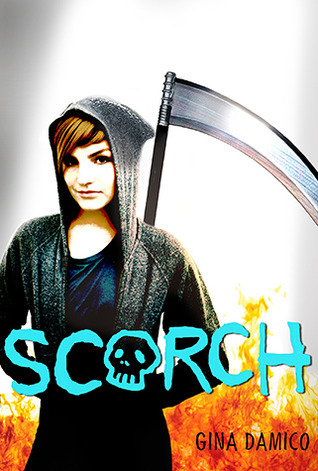 Scorch by Gina Damico was published on September 25, 2012 by Graphia. Ages: Amazon says 12 and up, but be aware that there is occasional strong language as well as lots of making out/mild talk of more than making out. Previous PostReview: ‘False Memory’ by Dan Krokos #ATBF12Next PostPaper or Hardback? crap, your review will have me up late, trying to squeeze this in cause i wanna know about the twists and what made you cranky…darn you!! awesome review as always cupcake! Tee hee! I can’t wait – you will have to let me know what you think, etc. etc. Thanks, Kimba!